Dr. Jeffrey Carson is the Provost, New Brunswick at Rutgers Biomedical and Health Sciences and served as Chief of the Division of General Internal Medicine until 2015. He is currently the Distinguished Professor of Medicine and Richard C. Reynolds, M.D. Chair in General Internal Medicine. Dr. Carson received his MD degree from Hahnemann Medical College where he also was Resident and Chief Resident in Internal Medicine. He obtained research training in clinical epidemiology during a two-year Henry J. Kaiser Fellowship at the University of Pennsylvania. Dr. Carson was a Fogarty Senior International Fellow at the University of Oxford, England from 1995–1996 where he received extensive training in clinical trials. Dr. Carson is a board-certified internist who practices office and hospital-based Internal Medicine. He has been awarded five teaching awards and been on the annual “best” doctor list since 1998. He received two research mentor awards from Internal Medicine residents. Dr. Carson’s expertise in clinical trials has been recognized by his appointment to Clinical Trials Review Committee at the National Heart, Lung and Blood Institutes where he served as Chair during his fifth year. 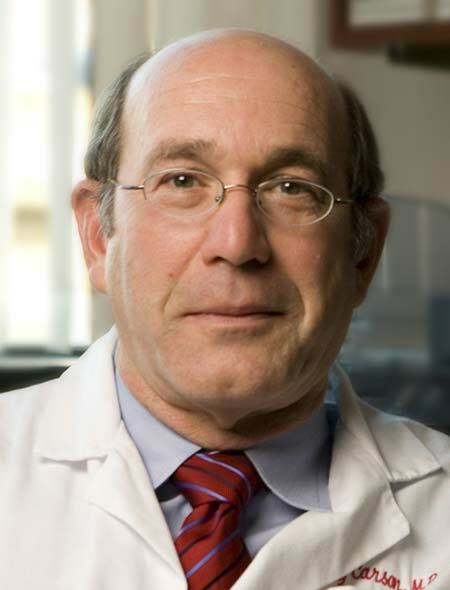 He has served as a member and chair of multiple clinical trial Data Safety Monitoring Boards. The focus of Dr. Carson’s research is on determining the risk of anemia and indications for blood transfusion. His work has been published in the New England Journal of Medicine, Lancet, JAMA, and Annals of Internal Medicine. His recent trial published in published in the New England Journal of Medicine and the Lancet and was recognized as one of the 34 key research findings published in 2012 funded by the NIH. His current work includes National Heart, Lung and Blood Institutes supported trials in transfusion in patients with myocardial infarction (MINT Trial; http://www.minttrial.org/), plasma use and blood utilization in China. Dr. Carson is a leader in Clinical Guidelines on Red Blood Cell Transfusion, systematic review and meta-analysis evaluating red blood cell transfusions, and author of chapter on red blood cell transfusion in the online textbook UpToDate. He recently published invited review on red cell transfusion in the New England Journal of Medicine. His research has been recognized by Edward J. Ill Excellence in Medicine Award: Outstanding Medial Research Scientist Award for Clinical Research, Excellence in Research Award from the Foundation of UMDNJ, Margot S. Kruskall Lectureship at Harvard Medical School, and he was the Keynote speaker at State of Science on Transfusion Medicine at NHLBI. He was recently inducted into National Blood Foundation Hall of Fame and elected as a member of the American Association of Physicians.